Lots of people come to Jesus today for the material things he can give them. As he told the people back then, so he tells us today: come to me for your spiritual needs. Your heavenly Father knows your earthly needs; seek first the Kingdom of God, and the rest will be taken care of (Matt 6:33). Jesus desires that we should follow him not for the material benefits, but for the spiritual benefits. 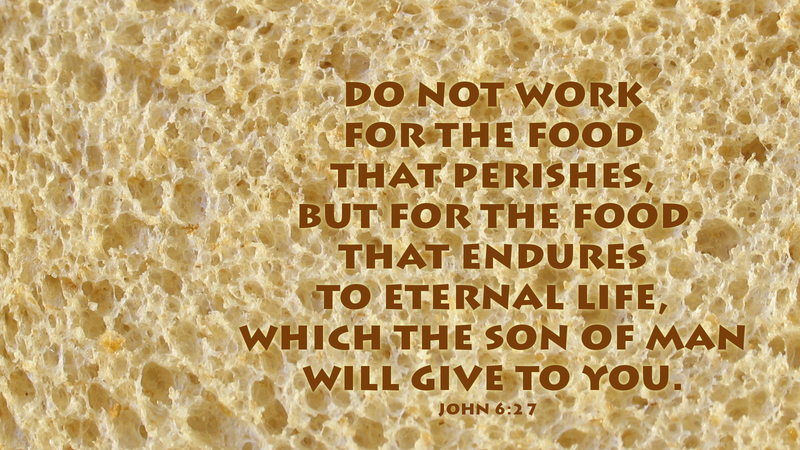 He alone can provide the food that endures to eternal life. He is that food. As we receive him by faith we partake of the Bread of Life and live forever. Prayer: God, grant us faith to receive Christ always, to be nourished by him, the true Bread of Life, and enable us to share him with others so that we might all live forever. Amen.